I made this Teddy Bear Birthday Cake for my son’s 1st Birthday. It took about 2-3 hours to ice but it was so worth it. My sister gave me the cake pan and I followed the instructions and it came out better than I expected. 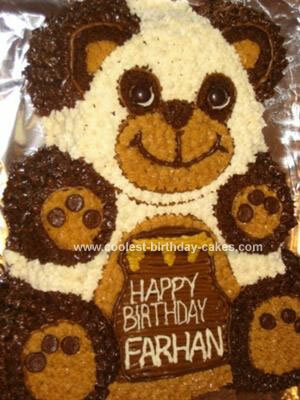 Right now… I am craving for it.. love the color and the image of teddy bear. Its cute and it’s gives you a feeling of cravenness. Yes I crave it whenever I look at it. I can’t wait for his 2nd birthday.